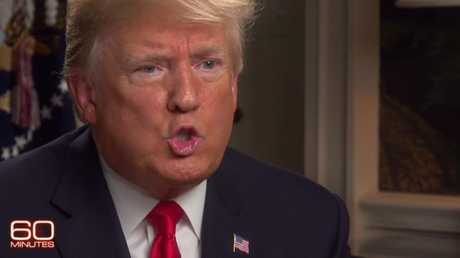 DONALD Trump insisted he's "not a baby" and issued a stunning admission about his own White House staff in a wide-ranging interview with 60 Minutes today. "The day before I came in, we were going to war with North Korea. I think it was going to end up in war," he said. "We were going to war with North Korea. Now you don't hear that. You don't hear any talk of it. And he (Kim Jong-un) doesn't want to go to war, and we don't want to go to war, and he understands denuclearisation and he's agreed to it." Ms Stahl pressed Mr Trump on Kim's trustworthiness, pointing out that the North Korean dictator had not yet handed over any of his weapons. Mr Trump said the peace talks had already made some progress, and in any case, he hadn't met North Korea's demands for international economic sanctions to be eased. "I haven't eased the sanctions. I haven't done anything. I haven't done anything. We're meeting. I believe he likes me. I like him. We have a good relationship," he said. "In the meantime, they haven't tested a missile. They haven't tested a rocket. They definitely haven't done a nuclear test, because you know about them real fast. "I do trust him. I trust him. That doesn't mean I can't be proven wrong." At a political rally two weeks ago, Mr Trump told his supporters he and Kim "fell in love". "And then we fell in love, OK? No, really. He wrote me beautiful letters. And they're great letters. We fell in love," he said. Ms Stahl brought up that rather striking quote, and contrasted it with Kim's record of oppressing his people. "I want to read you his resume. He presides over a cruel kingdom of repression. Gulags, starvation, reports that he had his half-brother assassinated, slave labour, executions - this is a guy you love?" she asked. "I know all these things. I mean, I'm not a baby. I know these things," Mr Trump said, calling his choice of words "a figure of speech". "Look. Look. I like, I get along with him, OK?" he said. "Let it be whatever it is. I get along with him really well. I have a good energy with him, I have a good chemistry with him. Look at the horrible threats that were made. No more threats. No more threats." Who is Kim Jong-un? : The story behind North Korea's leader. The president's optimistic attitude towards North Korea contrasted starkly with his harsh words for the United States' European allies. "I mean, what's an ally? We have wonderful relationships with a lot of people. But nobody treats us much worse than the European Union. The European Union was formed in order to take advantage of us on trade, and that's what they've done," Mr Trump said. "It sounds hostile," Ms Stahl said. "It's not hostile. You know what's hostile? The way they treat us. We're not hostile," he shot back. "We've been the stupid country for so many years." Ms Stahl steered the conversation to NATO, testing Mr Trump's commitment to the alliance. "It's been going for 70 years. It's kept the peace for 70 years," she told him. "You don't know that. You don't know that," Mr Trump said. He rejected the assertion of his own Secretary of Defence, General James Mattis, that NATO was preventing World War III. "Frankly, I like General Mattis. I think I know more about it than he does. And I know more about it from the standpoint of fairness, that I can tell you," the president said. "I like NATO, NATO's fine. But you know what? We shouldn't be paying almost the entire cost of NATO to protect Europe. And then on top of that, they take advantage of us on trade. They're not going to do it anymore. "I will always be there with NATO, but they have to pay their way. I'm fully in favour of NATO, but I don't want to be taken advantage of." 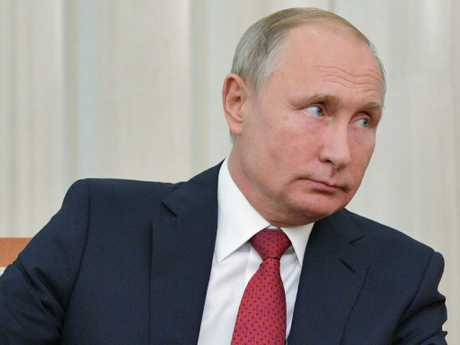 Mr Trump has been persistently slammed for his reluctance to criticise Vladimir Putin, particularly in relation to Russia's interference in the 2016 election. "I'm the one that gave Ukraine offensive weapons and tank killers. Obama didn't. You know what he sent? He sent pillows and blankets," Mr Trump said. "I think I'm very tough with him (Putin) personally. I had a meeting with him. The two of us. It was a very tough meeting and it was a very good meeting." Mr Trump said he thought Mr Putin "probably is" involved in political assassinations, and admitted the Russians did meddle in America's election. "They meddled. But I think China meddled too," he said. "I think, frankly, China is a bigger problem." Who is Vladimir Putin? : The history of the world's most powerful Russian. Special Counsel Robert Mueller's investigation into Russia's election interference has led to 32 people being charged so far, including Mr Trump's campaign chairman Paul Manafort, deputy chairman Rick Gates and national security adviser Michael Flynn. There is ceaseless speculation about Mr Trump moving to shut down the investigation, and in today's interview, when Ms Stahl pressed him to promise not to fire Mr Mueller, he stubbornly kept his options open. "Well, I don't pledge anything. But I will tell you, I have no intention of doing that," he said. "I think it's a very unfair investigation because there was no collusion of any kind. "There is no collusion. I don't want to pledge. Why should I pledge to you? If I pledge, I'll pledge. I don't have to pledge to you." "Everybody makes mistakes," he replied. "I could have been earlier with terminating the NAFTA (trade) deal. The problem was, I was getting to know the leaders, I was getting to know the countries. I didn't want to do it right out of the box. So I waited a little while." The Trump administration recently reached a deal with Canada to revamp parts of NAFTA - one of a string of recent economic successes for the president. America is recovering from a bitter political fight over the confirmation of Justice Brett Kavanaugh, who was Mr Trump's favoured candidate to fill the country's vacant Supreme Court seat. "If I had not made that speech, we would not have won," he told 60 Minutes. "I was just saying she didn't seem to know anything, and you're trying to destroy a life of a man who has been extraordinary." "Why did you have to make fun of her?" Ms Stahl asked. "I didn't really make fun," he said. "The person that we're talking about didn't know the year, the time, the place. "I think she was treated with great respect. There are those who think she shouldn't have been." "I don't trust everybody in the White House, I'll be honest with you," he said. "I'm not a baby. It's a tough business. This is a vicious place. Washington DC is a vicious, vicious place. The attacks, the badmouthing, the speaking behind your back." "I have some people that I'm not thrilled with. And I have other people that I'm beyond thrilled with," he said. "At some point, everybody leaves. Everybody. People leave. That's Washington." Mr Trump disputed the characterisation of his stance towards China as a "trade war", insisting it was more of a "skirmish" and China did not "have enough ammunition" to retaliate. "I want them to negotiate a fair deal with us. I want them to open their markets like our markets are open," he said. "I have a great chemistry with President Xi of China. I don't know that that's necessarily going to continue. I told President Xi we cannot continue to have China take $500 billion a year out of the United States in the form of trade and other things." Prominent Washington Post columnist Jamal Khashoggi vanished almost two weeks ago after visiting Saudi Arabia's consulate in Turkey. The Saudi government has been accused of being behind his disappearance. "It's being investigated. It's being looked at very, very strongly. And we would be very upset and very angry if that were the case. As of this moment, they deny it, and deny it vehemently. Could it be them? Yes," Mr Trump said. He promised there would be "severe punishment" if it turned out Saudi Arabia was behind the disappearance. "I think something's happening. Something's changing and it will change back again. I don't think it's a hoax, I think there's probably a difference. But I don't know that it's man made," Mr Trump said. He claimed the scientists pushing the world to act on climate change "have a very big political agenda". "I always used to say the toughest people are Manhattan real estate guys. Now I say they're babies," he said. "This is the most deceptive, vicious world. It is vicious. It's full of lies, deceit and deception. You make a deal with somebody and it's like making a deal with that table," he added, pointing to a piece of furniture. "I never knew how dishonest the media was. I really mean it. I'm not saying that as a sound bite," he said. "Lesley, it's OK. I'm president and you're not."